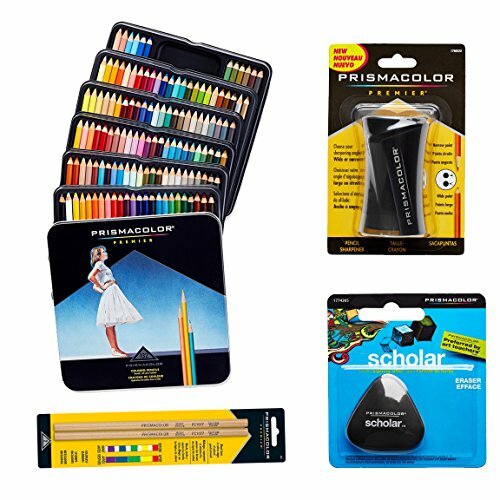 Bundle of 132 colored pencils in assorted colors, one eraser, one pencil sharpener and 2 blender pencils. The premier pencils feature pigments of unparalleled quality and leads that are thick and durable. With 132 shades packed with brilliant, lasting pigments, you'll have the right one to bring your illustration together. Blend your colored pencil colors together with the colorless blender pencils to create uniquely vivid blends. The triangular eraser cleans up unwanted lines, smears, and smudges, and is latex-free and PVC-free. It is not only convenient to use, but is also safe to use. The pencil sharpener has blades made of high-quality steel making the sharpening easier. It is ergonomic and can be used for eye liner, in your office, and with the actual Prismacolor crayons. These are indeed excellently-made art items that you should add to your essentials whether you are an amateur or a professional artist. ARTIST QUALITY COLORED PENCILS: The colored pencils feature soft leads that create a smooth color laydown and thick color cores that resist breakage. WIDE SELECTION OF COLORS: With a range of 132 vibrant colors, you are sure to achieve your masterpiece accurately and completely. EASY-TO-USE ERASER: The nice eraser has a triangular shape that fits comfortably in your hand and leaves behind minimal eraser dust. EXCELLENTLY MADE SHARPENER: The pencil sharpener is specifically designed to sharpen prism color pencils to a perfect point and has a translucent cover that keeps shavings inside until ready to empty. WONDERFUL COMPLIMENT: Effortlessly blend your colored pencil colors together with Prismacolor Premier Colorless Blender Pencils.